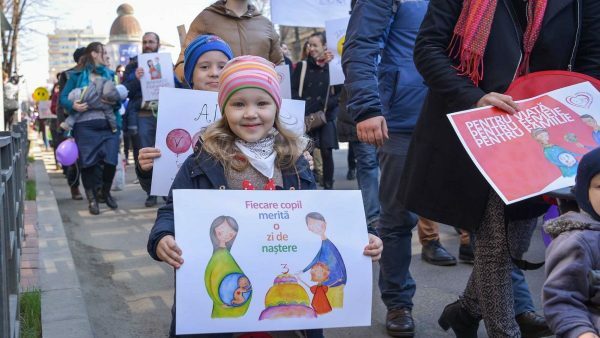 Thousands took to the streets on Saturday throughout Romania and Moldova to raise awareness of fetal rights and the need to boost resources for pregnant women in crisis situations, reports the Basilica News Agency. The March for Life, which took place in 600 cities throughout Romania and Moldova under the banner “Unique From the First Second,” is the main event in a series of activities being held in March, the Month for Life. Other events include debates, reading and photography workshops for children, conferences, and film screenings. Approximately 8,000 people participated in Saturday’s march in Iaşi, reports Adevărul. The event began with performances from several children’s choirs from Moldova, followed by several speeches. “Here is a feast of life, with the name of the unborn children, because in Romania there are many abortions and we want to be a voice for these children and to support the pregnant women in crisis. I think people have responded positively to our initiative because it is a reason for joy, a feast. We have many balloons, the messages on the placards are positive, we are for life and, as we can see, many young people have joined, so a generation that sustains life is being formed,” said Sorina Hângescu of Pro Vita Iaşi. Thousands participated in Bucharest as well. The event was organized by Students for Life and also featured several special guest speakers and singers. Students for Life president Eliza-Maria Cloţea noted that the day’s event means “we are with you and your child” and that there are “thousands of voices grateful for the gift of life,” according to the Basilica News Agency. A special place was also given to Monica Radu, who has birthed and raised three children despite being in a wheelchair for 21 years and despite the slim chances given her by doctors to have a successful birth.